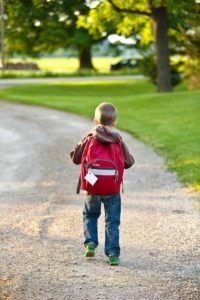 Sending your child off in the morning with a healthy lunch in their book bag does not have to be an arduous and demanding task. It is more convenient to grab prepackaged lunch foods (full of additives and preservatives) but all it takes is a few extra minutes and some pre-planning to ensure your child is eating foods that are wholesome and healthy. Establishing good eating habits during childhood is paramount in avoiding obesity. Children who are exposed and encouraged to eat healthier foods are less at risk of becoming obese or experiencing symptoms associated with higher-than-healthy weights. This article includes some quick and easy lunch ideas but you also want to consider the foods your child enjoys. Even if they are meals that are initially unhealthy, there are always ways to tweak them into healthier choices. Look at the ingredients and see if there’s anything you can swap out to make the meal healthier. You don’t have to go all out and buy catalogue-name-brand fancy containers for your child’s lunches. Dollar store or discount fair is good enough – just make sure it’s appropriately sized for your child’s meal. You can customize plain ol’ square containers by adding silicone muffin cups (or, as I do, washed out applesauce cups) to create dividers and add variety to the meal. Make a list of everything you need for the week and venture forth to the grocery store! Be sure to pick up the freshest ingredients you can. Again, here is where you can choose healthier alternative. For example, white bread can be replaced with sprout bread for sandwiches. Just because you ate it the night before doesn’t mean your little one can’t take it to school! Pack up any of those fresh, home-cooked meals and send them along the next day. Here they are – Super Easy Healthy Lunch Ideas! 1. Any type of fruit – grapes, raspberries, blueberries, strawberries, bananas, apples, etc. 2. Same with veggies – baby carrots, cut up celery, cucumber slices, etc. The important takeaway when it comes to packing healthy lunch for your child is to maintain nutritional balance. It’s okay to add in some treats that your child enjoys, just be certain that the majority of the meal is a healthy option. Oh, and by the way, don’t feel it necessary to cut sandwiches into stars or make apple slices into happy faces. Who has time for that?